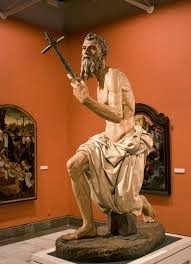 Passing between the Slave and Christ of Michelangelo into the gallery, the central statue is the celebrated St. Jerome, by Torrigiano – executed in terra cotta; it is now preserved in the Museum at Seville, and was originally in the Buena Vista convent, at the same city. 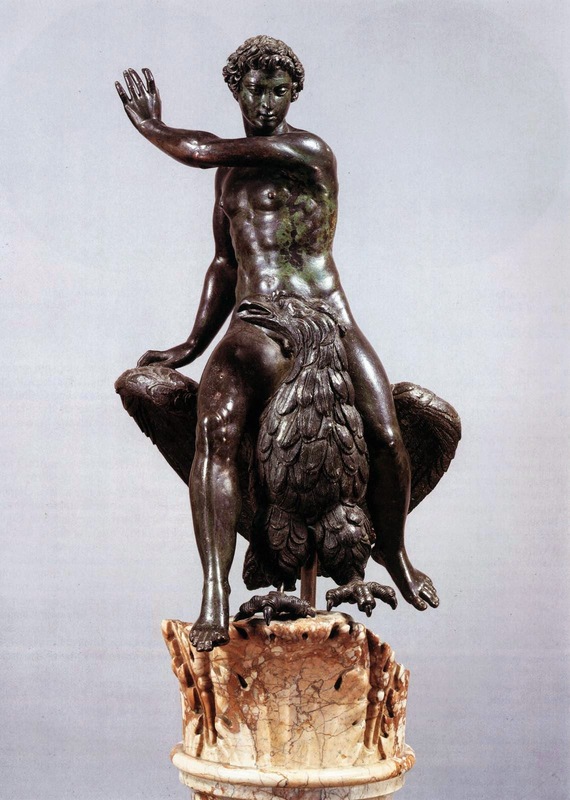 Over the St. Jerome is suspended the Ganymede by Cellini. The ceiling overhead is from the Biblioteca Antica, at Venice, [Biblioteca Marciana] and was designed by Serlio, the celebrated Italian architect and author, about the year 1540. The magnificent building in which it exists was built by Jacapo Sansovino, in the year 1536 and subsequently, to receive the libraries bequeathed to the Venetian Republic, by Petrarch and Cardinal Bessarione. Serlio was but a short time at Venice, and no works of his, with the exception of this ceiling, are now known in that city. 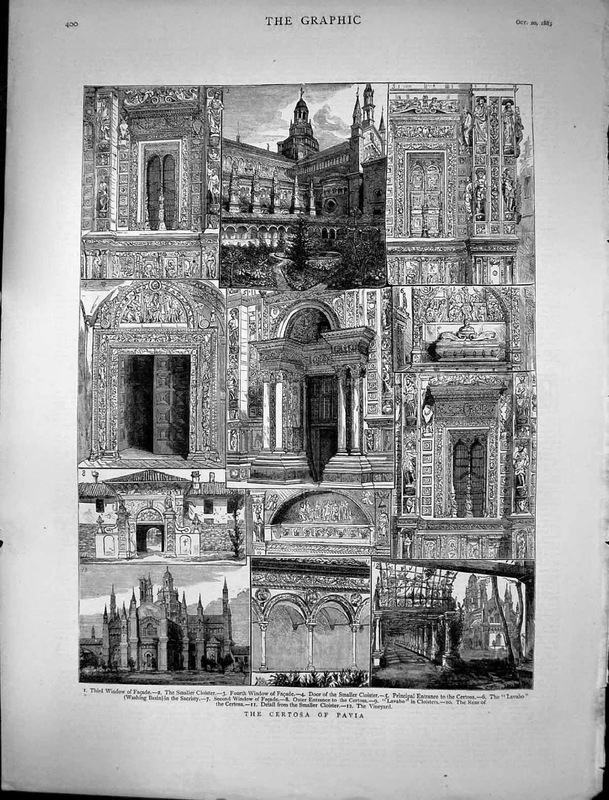 In the fourth book of his architecture . . . 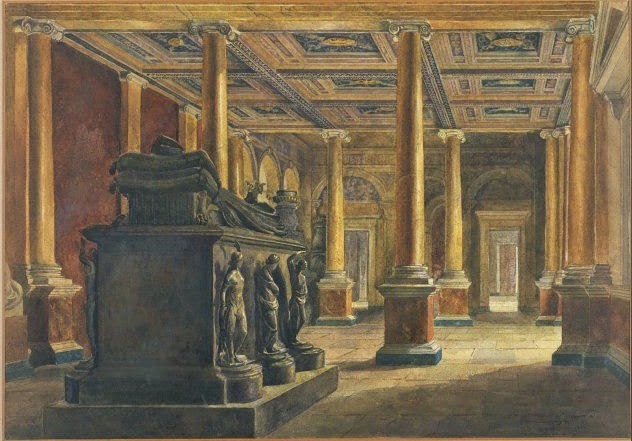 The four bronze pedestals at this part of the gallery are portions of those of the Piazza of San Marco, Venice, where they supported the standards of the Republic. They were designed and executed by Alessandro Leopardi, the Venetian sculptor, in the year 1505. 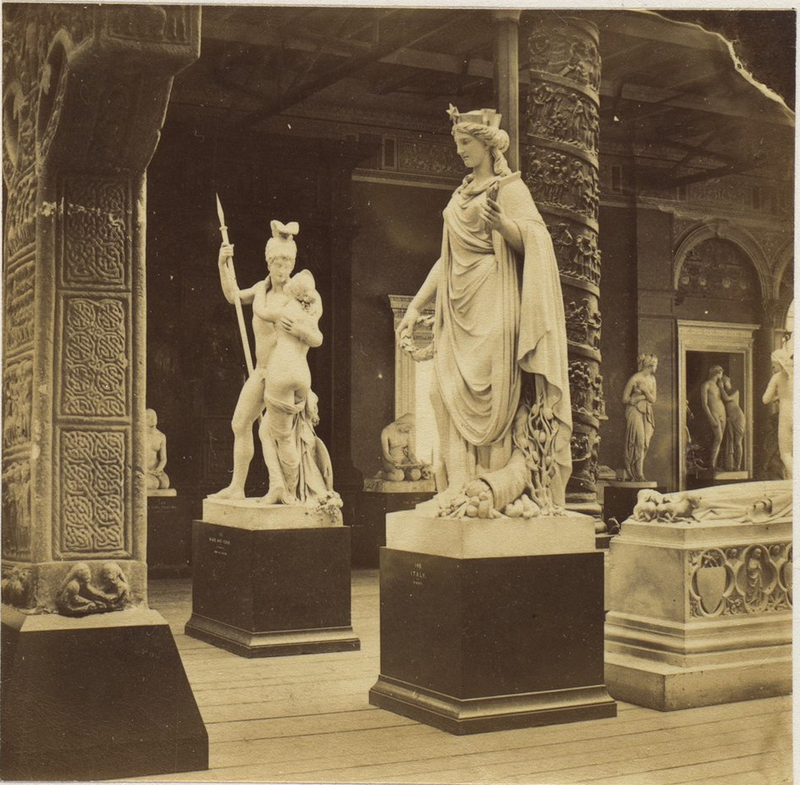 The subject on the plinths is a triumphal procession. Returning up the gallery towards the Renaissance Court is a very beautiful crucifix , from the suppressed monastery of the Certosa near Pavia; the figure of Christ is well executed, and at the four arms of the cross are the four Evangelists, with their emblems, very cleverly managed; the lower portion is founded on the form of an antique candelabrum, the details of which are also antique, with the exception of a few figures of monks, &c., in the oval wreaths. 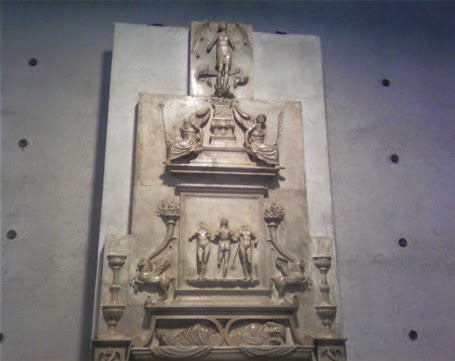 Beyond this, on the wall, is a very fine unfinished bas-relief of the Virgin and Child, by Michelangelo, from Genoa. It is one of the sculptor’s earlier works, and is characterised by great tenderness of feeling and boldness of execution. 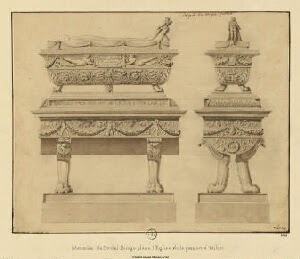 Beyond the St. Jerome, proceeding towards the great transept will be placed the sarcophagus of the monument to Daniel Birago, nominal archbishop of Mytilene, by Andrea Fusina [Andrea da Fusina], in the church of Santa Maria della Passione at Milan. The boldly cut ornament of this tomb is particularly good: two well designed angels support the following inscription, “Danielli Birago Archi Miyii pre hospitalis . . . . . .
On the wall opposite to this is a candelabrum from the Certosa, Pavia; in the lowest part are four ovals, containing bas-reliefs of the Evangelists, and above them, the Fathers of the church, and a Madonna and Child; other medallions filled in with religious subjects occur above these again, the rest of the design is founded on the antique, and although the name of the artist is not authenticated, yet from the similarity existing between this candelabrum and the crucifix and the two candelabra on the facade, known to be by Annibale Fontana, we are inclined to ascribe the two former also to him. 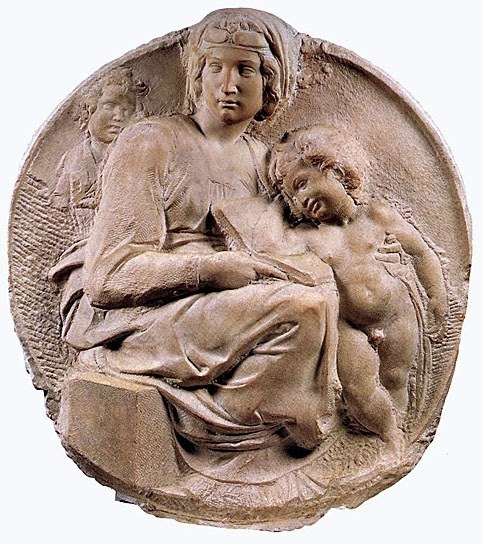 they are both unfinished, and are classed among his earlier works; in which are to be found a tenderness and grace not altogether free from the influence of Donatello, Da. Vinci, and others . . . .
We reccomend them to the attentive notice . . . In closing our remarks on the very valuable series of . . . The force and energy of his soul are seen on the . 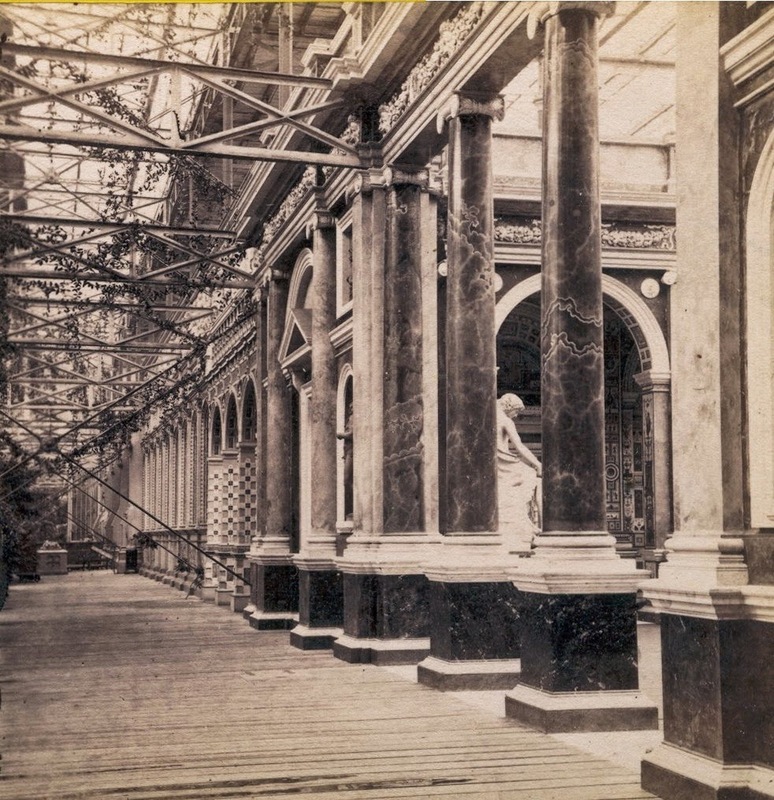 . .
Having completed his inspection of the works of formative art in the gallery at the back of the Italian Court and Vestibule, we would invite the visitors attention to the very beautiful vaulted ceiling nearest the Central Transept. 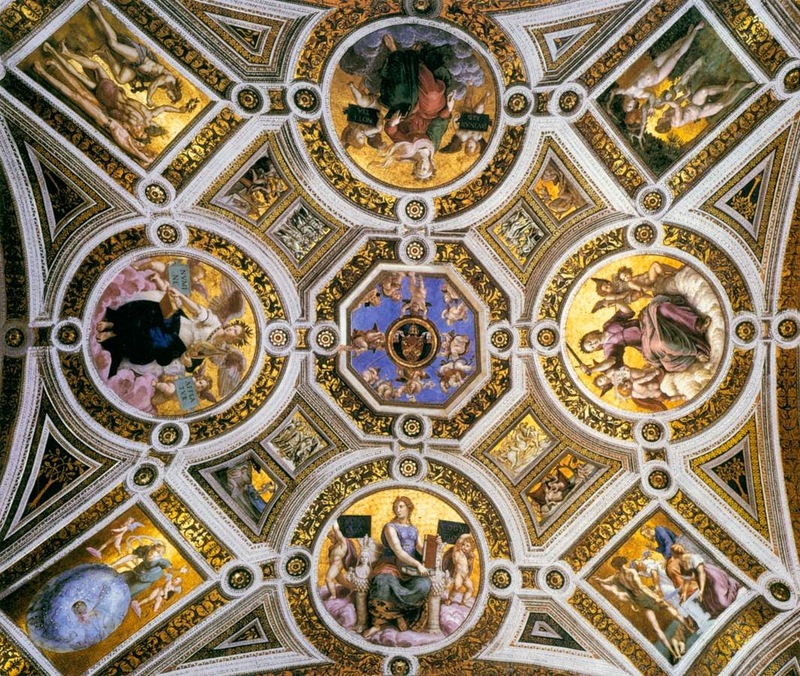 This ceiling is a perfect reproduction of that one in which Raphael exhibitied, perhaps more than in any other work executed by him, his complete mastery over the principles of the arrangement of painting, as applied to decorative purposes. The Camera della Singiatura, from which it has been taken, was the first of a series of rooms in the Vatican which Raphael commenced painting in fresco, by order of Julius II., and on which series he was employed until his death in the year 1520, even when they were still not quite completed. The present ceiling was completed in the year 1511, and consists of four compartments, each containg a large round, with the allegorical figures above mentioned, the interspaces being occupied by four oblong pictures, each subject in which relates to the figures in the round. It would be difficult to imagine a more faithful reproduction of this beautiful ceiling than has been made in the present case by Mr. Alfred Stevens, whose long residence in Italy, and profound study of Raphael, had eminently qualified him for the task. 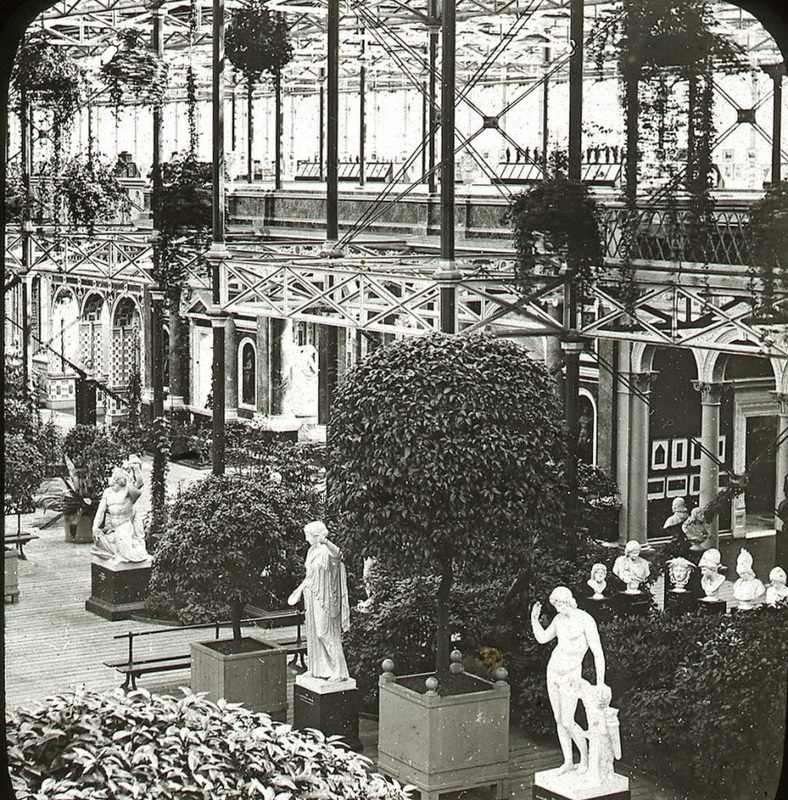 In its execution he was much aided by the loan, from the Council of the Royal Academy, London, of the elaborate copies of the various subjects of the ceiling, presented to the Royal Academy by Lady Bassett. The vestibule of the Italian Court is formed on the model of the Casa Taverna at Milan, painted in fresco by Bernadion Luini, an excellent follower of Leonardo da Vinci, whose works are numerous in Milan. We would draw particular attention to the doors which lead out of the Vestibule to the Grand transept, as beautiful examples of Italian architecture at the close of the 15th century. They are from the palace of the Cancellaria, at Rome; completed in 1494 by Cardinal Riario, nephew of Sixtus IV., from the designs of Bramante, and are excellent proofs of the great attention and study bestowed by that celebrated architect on the most minute details. On the wall of the Vestibule facing the transept, is the very beautiful altar of the Madonna della Scarpa, [ Cappella Zen] or Virgin of the Shoe (so called from the projecting and covered foot), from the cathedral of St. Mark, Venice, one of the finest exisiting examples of bronze work for which Venice justly obtained such reputation in the 16th century. It was commenced by Antonio Lombardo and Alessandro Lepardi, in the year 1505; but, owing to disputes between them, was completed by Pietro Lombardo, A.D. 1515. The Virgin is represented seated on a throne, the pedestal of which is ornamented with delicate “cinque-cento” work, with the winged lion of St. Mark at each extreme end. Within an oak wreath, beneath this, is the inscription "Pitri Joannis Campanati, M. DXV." 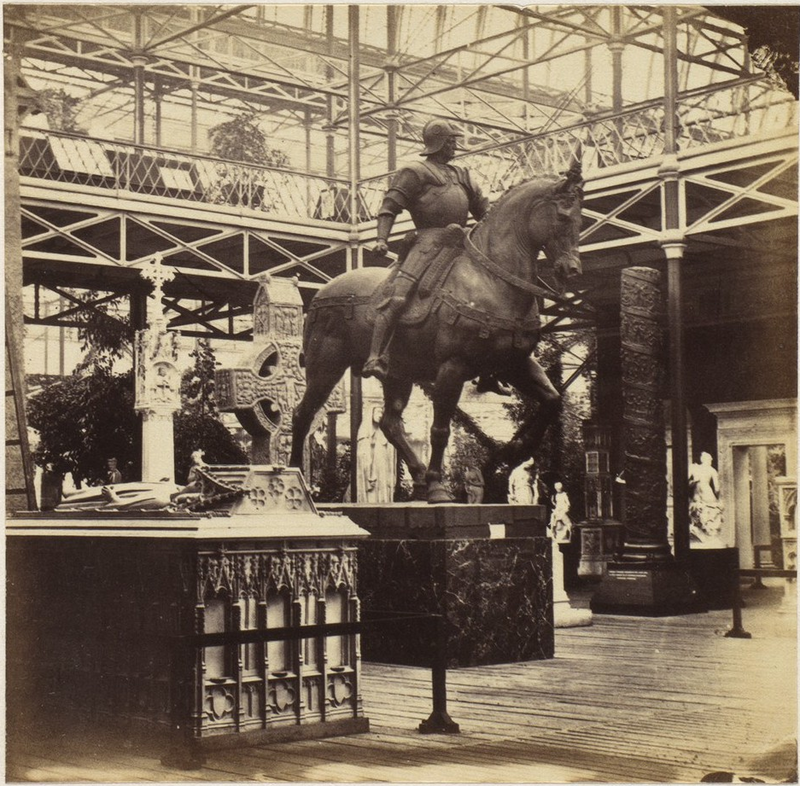 The ornament of the lower pedestal shows a graceful arrangement of antique and natural subjects. On either side of the Virgin are statues of St. John and St. Paul. The former is very much in Donatello's style; but eveidently studied from nature, as evinced by the head, the hands, the knees, the projecting heels, the breadth and bigness of the feet, the projecting bones of the big toe, and the natural length of the first tow, which, in the antique is very much longer than any other. St. Paul also bears the impress of Donatello's influence. His head is characterised by much mild dignity. The ornament is in an excellent Renaissance style, of which the pilasters are especially good examples. 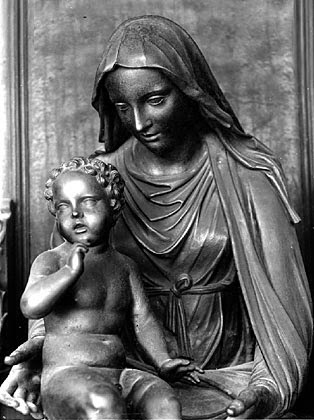 La Madonna con la scarpa dorata nella Capella Zen Basilica di San Marco a Venezia. 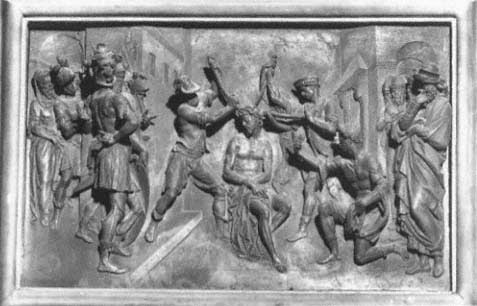 The frieze and the base of the altar contain subjects from the life of Christ, in relief, by John of Bologna [ Giambologna], from his celebrated bronze door at Pisa Cathedral [Duomo]. The first in the frieze, commencing at the left hand, represents Christ shown bound to the Jews; the second, Christ taken to be crucified; and in the third, he bears his cross. The first to the left, at the base, is Christ brought bound before the High Preist; in the second, he is crowned with thorns, and in the third, he is being scourged. They are all characterised by the sculptor's peculiar ability in grouping, and great energy of action. 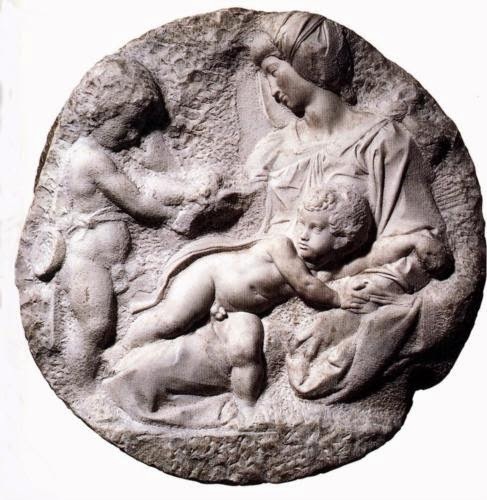 The two circular bas-reliefs in the dados are very beautiful examples of the Renaissance school, from the Berlin Museum. The subject of each, the Virgin and Child. 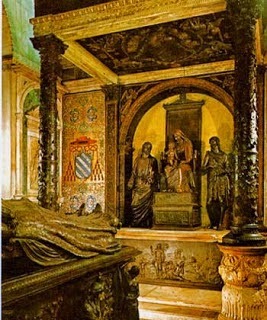 On the right of the altar, against the wall, is the monument of Lancino Curzio, the poet, from the Brera Gallery Milan – a chef-d’oeuvre of the Lombard sculptor, Augustino Busti or Bambaja. 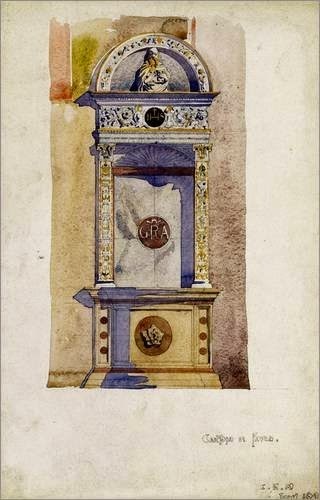 The effigy of Curzio is shown, placed beneath a curiously cut piece of scroll work. Beneath him is the inscription. . . The three Graces, holding inverted torches, at the top, are executed with all that delicacy for which the artist was so famed. They appear to be founded on the three antique graces, now preserved in Siena Cathedral: at the sides are the angels of Judgement and Victory, and above all, is a very beautiful winged figure of Fame, standing on the clouds. 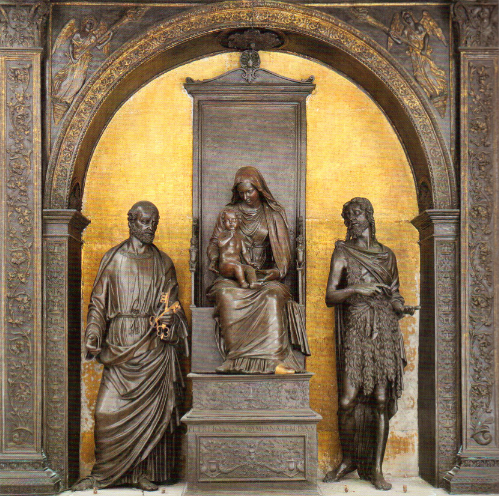 The whole style of the monument indicates a transition from the early to the second Renaissance period. 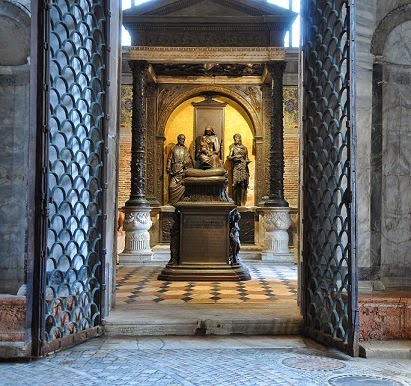 Below is a Sarcophagus, purporting to be the tomb of St. Pelagius Martyr, a fine example of the late Renaissance. On the left of the Madonna della Scarpa is the Sacrarium [sacristy?] of the Cappella of the Maddalena, at the Certosa, Pavia, a richly ornamented example of the Lombard Renaissance style, towards the close of the 15th century. A great number of excellent sculptors were employed in this magnificent monastery, but unfortunately there are no means of ascertaining - with one or two exceptions - the work of each respectvely. Below [next to ? as it appears to be a column] this are several pieces of ornament, by Andrea Sansovino, formed into a composition. 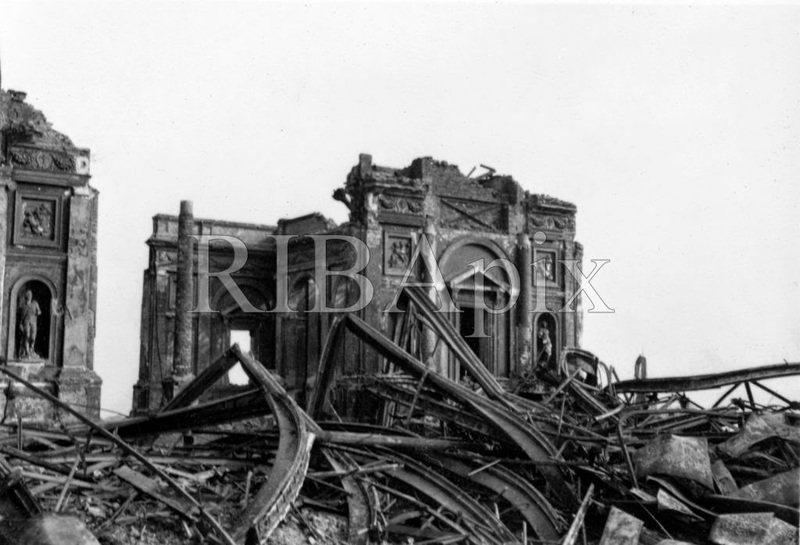 Italian Court after the fire of 1936. COURT OF MONUMENTS OF CHRISTIAN ART. 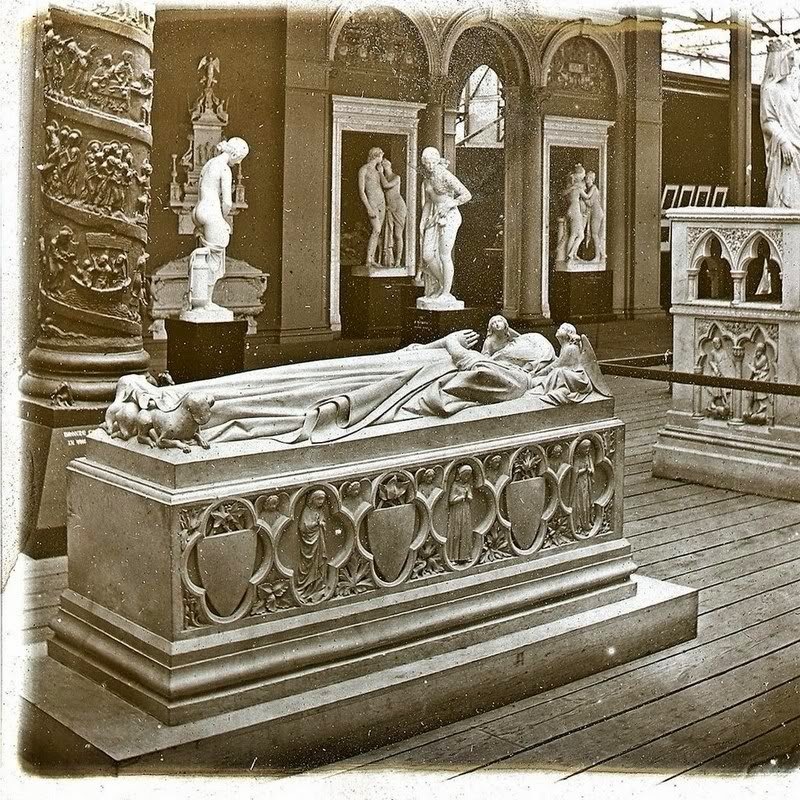 The principal specimen of Michel Angelesque design placed in this Court (at the end and placed farthest from the Nave), is the celebrated statue of Moses originally intended to form part of the magnificent tomb of Julius II., the plan of which was so imposing that it is said to have induced the Pope to undertake the rebuilding of St. Peter's. Many sonnets have been addressed to this statue, the most noted . . . 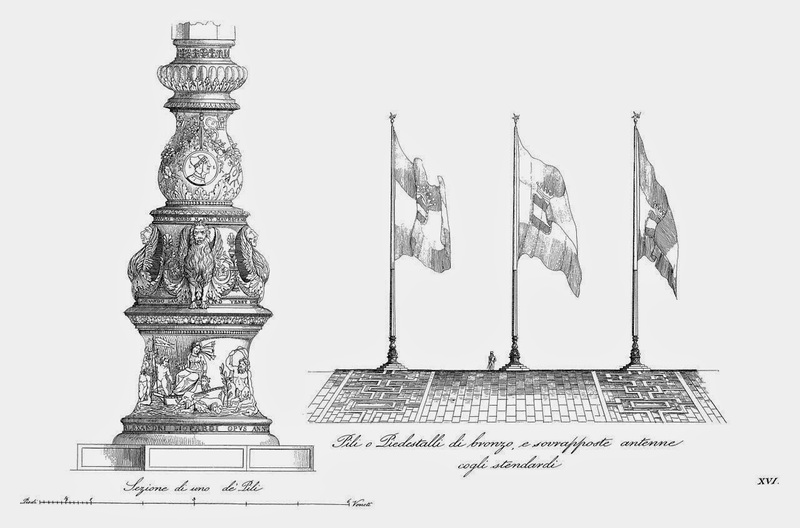 Beyond the equestrian statue of Gatta Melata, in square piers, both on the left and right of Moses, are excellent examples of the state of French ornamental art in the last half of the 17th century, from a votive offering erected by Louis XIV. (1643-1713), in fulfilment of a vow of Louis XIII., now in the cathedral of Notre Dame, at Paris.